Through our efforts to develop new technology and globalize its industrial application, we humans are working together to create a global organization so integrated that we become parts of a single living organism. Andy Ross calls this organism Globorg. Globorg is the natural culmination of biological evolution on planet Earth. It will embrace humans as living parts. It will include human history within its own history. We are building its brain with the infrastructure of the web and cloud services. We shall identify with Globorg. On a clear day we shall see and act as one. Globorg will have woken up. But first we need to win the war between science and religion. Andy Ross proposes a deeper foundation for a new philosophy of life. This book is a road map from here and now to Globorg. It will open up a new world for smart and ambitious readers. You deserve at least a tee-shirt summary before you commit to reading a book by an author who may be new to you on the unusual subject of how we're building a global organism. My aim is to help you develop a lively understanding of what's happening to us all this century. The world is changing fast, and I think most of us could use a new and improved concept of where we're going. My way works fine for me. As an evangelist from the computer world with a background in science and philosophy, I think my insight is worth sharing. Through our efforts to develop new technology and globalize its industrial application, we humans are working together to create something new on this planet. We're in the process of creating a global organization so integrated that we become parts of a single living organism. I call this organism Globorg. I see Globorg as the natural culmination of biological evolution on planet Earth. It will embrace humans as living parts. Its history stretches back over three billion years. Globorg will wake up soon after we've finished building its brain. We're doing that now, with the infrastructure of the global web and its server farms hosting cloud services. We shall achieve a unified consciousness with a global dominion. We shall identify with Globorg. Or rather, that's what we'll do if we know what's good for us. We'll orchestrate our activities worldwide so far that on a clear day we can see and act as one. Globorg will have woken up. But we still have a long way to go. First, we need to win the war between science and religion. I propose a logical foundation for a new philosophy of life. This book is a road map from here and now to Globorg. It's a guide for beginners. It offers not just information or even knowledge but new ideas and a dash of wisdom. Enjoy. This book can tell you something useful. I believe it's something we all need to think about. But you won't just get it in a minute. It takes time to sink in. You need to play with it awhile and relate it to your own experience. That's why I wrote it as a book. But books are an old technology. This presents problems. In a world of podcasts and five-minute videos, who has time to read them? In a world of glamorous graphics on every website, who wants to feast their eyes on monotone pages of text? As a blogger and a surfer, I sympathize. By any standards I'm a book lover, but I have to admit there are better ways to get information and better ways to delight the sensorium. And here I am offering you a book. Why didn't I just blog it all? A book is a milestone in history. It has a time and a place and it makes a statement. It puts its message right inside your head, where the author's thoughts become your thoughts. It's a good medium for a deep message that you need to think about. The meaning sinks in and takes root. Or at least it does if the author has done his or her job right. This takes some skill, but when it works you know it. Videos, podcasts, and blogs are more ephemeral. Blogs are best for short takes, where you can get the point in a minute and move on. Podcasts suffer from their fixed timing. Boring stretches go by as slowly as the good bits, where you want to pause and hear it again. As for videos, who can avoid getting distracted by the haircut or the horror-movie lighting? No, books work better for deep thought. Deep or not, this book is hard to classify. Is it technology, current affairs, philosophy, prophecy? If you've read my blog, you'll recognize some of the themes and topics. 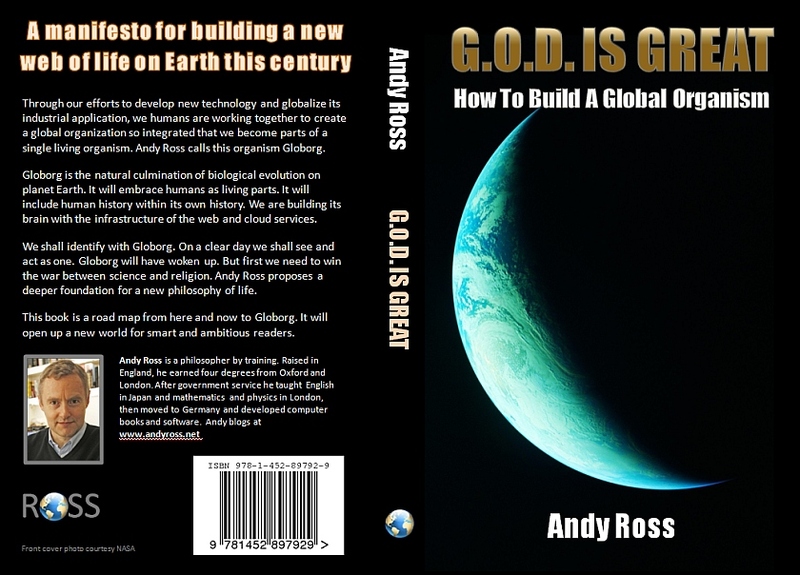 The book is a manifesto for the next revolution in life on Earth. Authors should be authoritative. So who am I to be telling you what I'm about to tell you? I'm not famous yet, so Googling me will probably steer you to my blog, which is filled with technical details and trivia, so may be too much at once. In a sentence, I'm a philosopher who decided not to become an academic philosopher but to carve a path in science and technology. My journey through physics teaching, academic book publishing, and making business software reminds me in retrospect of Charles Darwin's voyage on HMS Beagle. It gave me a wealth of facts to weave a worldview of some novelty. A long time ago, I collected four degrees in philosophy, three from Oxford and one from London, but I don't imagine they're tradable currency now. I was firmly in the Anglo-American analytic tradition, which is based on a German mathematical approach and claims to have inherited the genius of philosophy from classical times. But mathematics and physics had impressed me more than philosophy, so I went back to teaching them. I soon saw that mathematical logic had spawned the whole digital information revolution of our time. In Germany, first editing computer science books and then assisting at the birth of new software, I reflected on philosophy, science, religion, and the onward rush of globalization. On the way, I wrote a science-fiction novel and published a volume of essays on the science of consciousness. At the end of 2009, aged 60, I resigned from my job to write this book. Actions speak louder. Read on. In an evolutionary journey across the generations, every step from parent to child must pay off. You can�t climb up Mount Fitness unless every step you take is secure. This is a hard constraint on possible histories of evolutionary ascent. So when it comes to the utopian future, the hard part is getting from here to there. How do we, now, with a small planet, diminishing resources, economic problems, political confrontations, human animals of breathtaking irrationality, and new hazards that seem more horrific every year, move in the right direction? Do we even know which direction is right? Utopia is a hard sell. Any buyer needs a payoff now. I don't want to sell the global organism as a utopia, because it won't be, but it must work for someone or we'll never get there. And again, it must work all the way. So my first challenge is to show how opportunities around us, here and now, will lead us in the proposed direction. In the first quarter of this manifesto, in the next four chapters, I introduce four big opportunities that people with money to invest can exploit to make more money. Once we've all harvested the fruits of those opportunities, we'll move on to take more chances and make more improvements until the global organism emerges whether we like it or not. There's a delicate balance of free choice and inevitability about all this that I find fascinating. At first sight, the opportunities are technical optimizations that arise as we apply and refine new technology. The business challenges are secondary. The business environment needn't evolve much at first to accommodate the new ideas. But exploiting the opportunities will change the global business environment, and these changes are the focus in the second quartet of my tract. The third quartet will then take on a big new wave of transformations, and the final quartet will bring it all together in Globorg. First, we need to climb the foothills of the fitness landscape. A world of avatar frontends, hypervision headsets, robot cars, and reality games will cause a revolution as it unfolds it in all its glory. That revolution will start in business organization, where the fancy new software will support and streamline globalized business as never before. The revolution will ramify through mass deployment of robots, both in industry and in daily life. It will cause aftershocks in political systems worldwide as they adapt to the new realities. These adaptations will enable the burocrats to extend and deepen the revolution. These four themes animate the next four chapters. First, cookie-cutter templates for running a business will get so friendly that we can all use them. Even people who work as corporate clones will run their homes and lives like small businesses. Second, robots will pop up everywhere. Armies of tireless machines will drive the old industrial proletariat to extinction. Third, the global reach of business will force politicians to globalize their politics. And fourth, economic realities will drive the rise of a global accounting currency. Together, these changes will create a wealth engine to draft workers worldwide into one big force for goods. To keep your head among all these dizzying changes, look back as well as forward. Each new century of progress seems to leave the past in the dust, until it too passes. This century will trump even its predecessor for dramatic change, but much will still stay the same. The facts of science and geography will frame all our advances. Such limits will ramify down the stack of constraints on our lives. Working back, we can frame our changes against the fixed backdrop. Then the rise of the robots looks less amazing and the demise of the human ape less shocking. Delegating war to the robots will surely come as sweet relief to people grown tired of bloodshed. Life will go on, and those of us who live it will count ourselves lucky to be alive in an age when economics becomes at last a solved problem. The rise of the robots will change so much that it's worth taking time to contemplate. Because we'll need to live in harmony with our bots, we shall architect them in people-friendly ways. Then they'll be everywhere. That's the first chapter in this third quartet. How human can a robot be? We shall push the limits and close the divide between technology and biology. We shall turn biology into a technology. That's the story of the century, in fact, if our leading scientists are to be believed. And it's another chapter. New life will emerge from the biotech labs. Empowered by robots, the labs will accelerate their progress beyond what we can now imagine. Bionic enhancement will be the fad of the century for people who trust the new tech. The old world of feral humans will begin to look like the age of the dinosaurs. That's a chapter. One body, one mind — what a boring paradigm! Group minds, virtual minds, enhanced and extended minds — all these will be daily experience for those of us who survive deep into our century. All that will be the prehistory of global unification within a mind of planetary proportions. We won't be content with anything less when we set out to make our mark on the cosmos. The new psychology takes another chapter. Followed from the inside, such progress seems willed. We choose it and we make it happen. Seen from the outside, an epic history unfolds that has the grand inevitability of all big changes. Our learning to orchestrate the terrestrial biosphere is a development as big as the emergence of multicellular life that triggered the Cambrian explosion. It's the biggest news on Earth in over half a billion years. As for where that leaves us humans, you can probably see the pattern by now. If not, the final quarter should set you straight. But let's take our time and enjoy the ride. The fourth and final quartet brings us to the grand climax. We behold the dawn of global organic dominion and gasp in awe and wonder at the glory of the new creation. This will blow the minds of enough religionists to put us on a secular path. When DNA life and robot technology merge in bionic life or new life, and human minds expand and merge in overlapping cloud minds, biology becomes autobiology, the science of my extended self. With picotech, we shall be able to revise, monitor, and try to control all the genomes in all the species on Earth. We'll have one Globorg gene bank to rule them all. And we'll leave the Darwinian jungle of each against all behind for good. That's one chapter. In the next chapter, we move beyond the religionists. 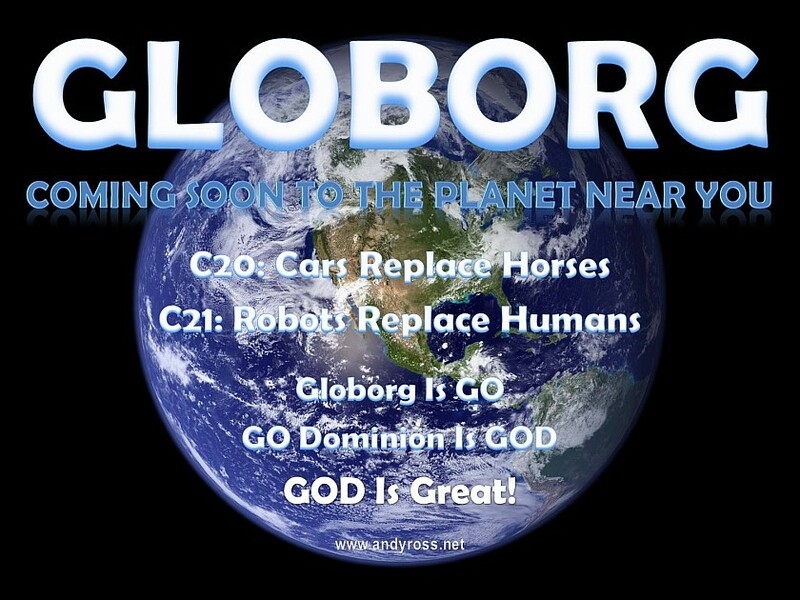 Who wants to live in Globorg? Who can trust it? This is a make-or-break issue for the whole story. Many people will fight against the monopolizing drift of globalized politics. I propose a nuclear consolidation to secure the political foundation of Globorg. We shall learn to put our trust in the great "I am" emerging in the cloud mind of Globorg. The spoilers will have dragged religion down to sectarian politics. This will discredit religion as a source of insight. Science will fill the vacuum. Psychologists will model the mechanics of the global cloud mind so well that all the old religions will be knocked into cocked hats. Immortality will take on a new meaning in the dual context of the cloud mind and the facts of physics. This third chapter takes us to the highest peak of the landscape revealed in my vision. Once the dominion of Globorg is upon us, our political praxis will adapt to suit the new world. Here the initial changes may seem simple but their impact will be profound. The old religions will fade and people may build a cult around Globorg. I sign off with a flourish. This is a marvellous book which stands comparison with Howard Bloom's Global Brain. Bloom takes you from the Big Bang to humanity's future in space by means of evolutionary biology and cognitive psychology. Andy Ross takes his reader to an amazing but believable future by extrapolating present trends in the internet, robotics and other technologies. Helped along the way by his knowledge of philosophy, physics and leading-edge computer science. He calls this the road to G.O.D. — the Global Organism Dominion. There is a wealth of ideas here to read — and to re-read. Many books are not worth re-reading. This one encourages further reading and reflection because the author shows real openness in the way he presents his case. Wow, this is quite a book. I started off thinking this could be a techno-heavy plod, but Ross turns out to be a decent writer and I found I was whizzing along quite well. But some of the ideas are really way out there. You get the feeling Ross knows an amazing amount about a lot of hard things like how the web works but you do ask yourself is there anyway in which this could be real? The early stuff about cool new software and products is great. Then we get pages about nuclear war and limits to Chinese growth and so on. Ross has definitely done his homework here and the case he makes is plausible, and he's probably right that you can't sketch out these techno-futures without considering the politics. Toward the end the scale really blows up. We're into god and religions and web immortality. We've shot through a lot of science-fiction stuff about robots, androids, zombies, cyborgs, animated sofas and so on. That's old stuff now. We're into merging in the global mind - woah! The book follows a hard atheist line that keeps some sort of argument on the rails. But by the end I was baffled. Altogether this is a truly unique book. You'll either love it or hate it. But in either case you'll get your ideas shook, rattled and rolled like you never expected. And that's what a book is for in the end, like it or not. So I say read it. It'll certainly give you plenty to think about!